There’s no doubt about it: microgames are in right now. And the innest one of the last two weeks has been Coin Age, a small game played with a single card and pocket change. Coin Age is currently on Kickstarter with a pay-what-you-want campaign managed by Tasty Minstrel Games. The game has appeared at the top of Board Game Geek’s hotness for several days in a row and has already blown past all of its stretch goals, netting backers several maps (including one made of credit card plastic) and additional benefits. We had the chance to interview Adam McIver, the game’s designer. 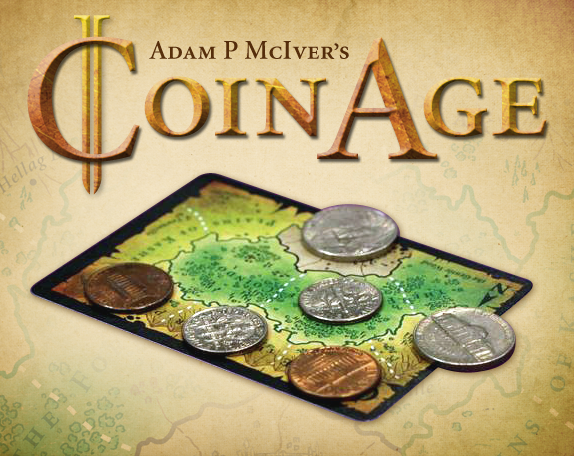 Coin Age is a two-player area control microgame that is played with a single map card and pocket change. It’s a little gem that’s close to my heart and is being published by Tasty Minstrel Games. What led you to design Coin Age, and why did you release it as a print-and-play? I kept finding myself in situations or locations where I had some time to kill with a friend, wishing I had brought a game along. I’ve loved the recent surge of microgames, but even a game like Love Letter requires the forethought to bring it along. If you don’t carry a bag of some sort around and aren’t into cargo shorts, you’re most likely not carrying a game at all times. I started thinking about what sort of items I typically carried with me, and how I could make a game out of them. I started playing around with the very beginning ideas of Coin Age around a year ago, and once I realized that you could essentially “roll dice” with coins, it began to take shape into what it is today. I always planned on giving Coin Age away for free. It isn’t a very retail-friendly concept, and all I was really interested in was getting people to play it. My initial intent was to give it away with my business cards at conventions. And that’s essentially what I did. I gave out several copies at Gen Con 2013, and one of them made its way to Michael Mindes of Tasty Minstrel Games. He was interested in doing a print run of it, which took some convincing since I didn’t want people to feel ripped off after essentially buying a single card. Luckily, it meshed extremely well with his new pay-what-you-want formula, he didn’t want to fiddle with my rules, and he was completely willing to let the game stay free to print and play. All that combined together and seemed like a good deal for everyone involved. Are there any gameplay differences between the print-and-play version of Coin Age and the Tasty Minstrel version? No, aside from the new maps we’ve been able to add on through the Kickstarter campaign, which has been a blast. In addition to those, backers are already putting together custom maps, multiplayer variants, and all sorts of other things, which is incredible. I never expected people to get so involved, and I’m extremely excited to see where they take the game. In your Twitter bio, you mention that you are the “CEO/Creative Director/game designer with” Project Game. What is Project Game, and what does your involvement entail? Project Game is a game design and development collective I started here in Chicago a couple years ago with J. Alex Kevern and Levi Baer. They were integral to the evolution of Coin Age. We are constantly designing and developing board games, and the sheer amount of progress we’ve made since we all first met amazes me. We’ve had three games signed by great publishers in the past year, and we’re well on our way to self-publishing our first title early 2014. Do you have any other designs you’re working on that you’d like to talk about? Absolutely! I’ve been working with the Project Game guys for the past year on Gold West, which will be our first release. It was designed by Alex, and I’ve been helping with development and doing all the artwork. It’s an incredible, meaty euro about the American Gold Rush, We’ve had the opportunity to show it at UnPub and Protospiel events as well as BGG.Con, and the response has been incredibly positive. Everyone tends to ask when they’ll be able to support it on Kickstarter, so we’re doing our best to make sure that time will be soon. Is there any other place you’d like to direct our readers? Thanks to Adam for answering our (very brief) questions. There’s still time for you to get in on Coin Age on Kickstarter.